Wildlife Habitat Restoration helps the City of Shawnee manage invasive/noxious weeds in our city parks. For this project we are specifically targeting honeysuckle in Gamblin Park. The honeysuckle we target is not native to America and crowds out our native plant and therefore our native animal habitat. We are seeking groups, families, and individuals for various roles. 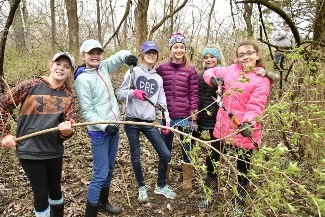 The roles include: cutting the honeysuckle, treating it with chemicals, dragging it out of the woods, and picking up any exposed trash. PLEASE NOTE: Those age 12-18 who have a parents’ consent can use the loppers otherwise their jobs would be hauling the cut honeysuckle or collecting any trash. We ask you to bring loppers or a hand saw, dress appropriate for the weather and being in the woods, and bring water for yourself. RAIN OUT DATE is April 27th, same time, same place. Please park at Monticello Trails Middle School: 6100 Monticello Rd. 66226. Volunteer check in will be under a tent just south of the parking lot in the grassy area. Location: Donald B. Gamblin Jr. Park. Must be 18+ and will use applicators to apply chemicals to the cut honeysuckle. I have a group of 4-8 people and I have read the job duty information and understand I need to have at least one person to cover each job duty. We have the appropriate ages in our group and can cover all four roles with our group.